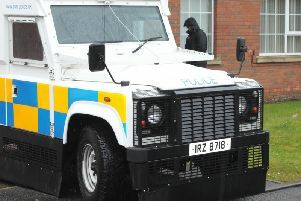 After his vehicle was attacked with water balloons a 23-year-old man confronted young people with a wheel brace, Craigavon Magistrates Court heard last Friday. Chris Faloon, Ferngrove Park, Craigavon, was sentenced for a series of offences. He admitted driving without insurance on May 18 at Charles Street in Lurgan and possession of an offensive weapon, a wheel brace, in a public place. Faloon also pleaded guilty to driving uninsured at Bridge Street, Portadown, on July 9 and not having insurance on July 26 at Castor Bay Road and using a vehicle which was in a dangerous condition. A prosecutor said the offence of having an offensive weapon arose when water balloons were thrown at the defendant’s car by children and he confronted them with a wheel brace. He added that the balloons were thrown from a play park. The defendant’s partner and young child were in the car which Faloon stopped in the middle of the road. A barrister representing the defendant said he had been driving along when he came under a barrage of water balloons. He added that this was not the worst thing that could have been thrown at him. The lawyer said Faloon asked the youngsters to desist but they didn’t and one balloon came through a window and hit him. “He should have known better,” he commented. The barrister said Faloon would welcome some supervision in his life and at the time he was under the impression that he was insured to drive the vehicle. Deputy District Judge Laura Ievers imposed a 40 hour community service order and banned him from driving for six months. For using a vehicle in a dangerous condition she fined him £100 and ordered him to pay a £15 offender’s levy.